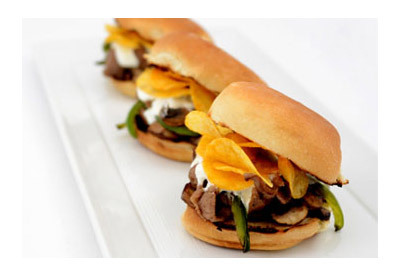 Bring a taste of Philadelphia to your tailgate with this bite-sized take on the classic cheesesteak featuring LAY'S Classic potato chips! 2. Whisk in the flour and cook for 1 minute. 3. Slowly whisk in the warm milk, and cook, whisking constantly until thickened, about 4 to 5 minutes. 4. Remove the mixture from the heat and whisk in the provolone and Parmesan until combined. 1. Heat oil and butter in a large saute pan over high heat. 2 Add the onions and peppers and a pinch of salt and pepper and cook until golden brown, stirring frequently. 3. Add the mushrooms and cook another 10 minutes until soft and golden brown. Stir in the parsley; set aside and keep warm. 1. Place steak in freezer for 30 to 45 minutes; this makes it easier to slice the meat. 2. Remove the meat from the freezer and slice very thinly. 3. While Steaks are chilling make the Provolone sauce, mushrooms, onions, and peppers. 4. Heat griddle or grill pan over high heat. Brush steak slices with oil and season with salt and pepper. Cook for 45 to 60 seconds per side. 5. Brush the buns with oil and griddle. 6. Place several slices of the meat on the bottom half of the roll, spoon some of the cheese sauce over the meat, and top with the mushrooms, onions, and peppers. 7. Add the LAY'S Cheddar and Sour Cream Potato Chips and serve.